Since first opening its doors back in 1978, the customer’s satisfaction has always been top of the agenda for Ulster Tyres Ltd. Irish Trucker found out more from General Manager Fiona McGinley, who has been a part of the family-run business for more than a decade and a half now. A family-run business can often turn out to be the best one and Ulster Tyres in Ballybofey, Co Donegal is a shining example of that. Founded and owned by husband and wife team Joe and Brighid McGinley, the company has close to 40 years’experience as one of the Ireland’s largest distributors of passenger car tyres to the specialist tyre retail trade, the car dealership sector and the consumer retail market. They first opened their doors on January 1, 1978 and haven’t looked back ever since. Fiona McGinley, daughter of the two Managing Directors. “I’ve been here 16 years and almost all of my family have done stints with the company. My parents Joe and Brighid still take an active interest in the company, which I’m delighted to report. Indeed both Joe and Brighid have spent their professional careers dedicated to the tyre trade to help ensure the evolution of their company. The pair’s knowledge and hard work have seen their business grow substantially in the 38 years the company has been trading. “We are a tyre importer and distributor. Basically, we like to see ourselves as a one-stop shop for everything and we’d have customers from all over –north and south of the border. A new premises was built in the early 1980s, quickly realising they needed more space, added another store two years later. A further substantial extension was added in the late 1990s, a new head office was built with multiple fitting bays and large warehousing facilities standing on an impressive three quarters of an acre site. This brings the storage capacity to over 100,000 square feet. Ulster Tyres offers a substantial array of products to both trade and retail customers. 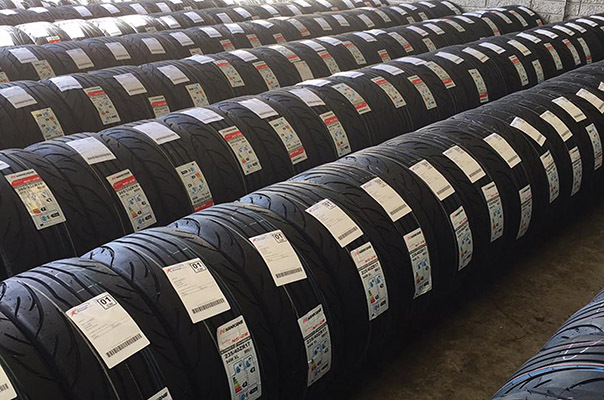 It’s highly respected as a single source point of information within the industry and is now the longest established independent tyre wholesaler in Ireland. The company’s Letterkenny branch was opened in the mid-80s and is located on the Port Road in a key location. It’s located on the main thoroughfare into Letterkenny. Its primary focus is on retail customers and has built strong relationships with all the key car dealerships in the area. Speaking of strong relationships, Ulster Tyres has always boasted a unique connection with their customers and suppliers down through the years. Fiona feels this is what separates them from their competitors and is part of the reason why they’ll be celebrating their 40th anniversary two Januarys from now. “We have customers from here to Dingle (Co Kerry) and we’ve been known to leave tyres for them at the port for the Aran Islands sometimes,”the General Manager outlined. “We’ve done a lot for our customers down through the years and we go looking for them. In other words, we don’t want our customers to come looking for us. Standards also come into it as well, as Ulster Tyres only sells the very best products to its customers while also offering them valuable advice. “We’re also very sticky about standards and we do not sell second hand tyres,”said Fiona. “When there’s new legislation brought in we always circulate that information on to our customers so as they can find out how it will affect their business. Four-wheel laser wheel alignment and wheel balancing are part of the package that Ulster Tyres provides as well, with all of the company’s services available to view on their website (ulstertyres.com). The latest service on offer at Ulster Tyres is their new ‘Call and Collect’service, which is ideal for customers in need of tyre repairs on their vehicle. It applies to customers that are in quick need of repair and Ulster Tyres are happy to collect and deliver their vehicle from the home or workplace within a five mile radius of Letterkenny or Ballybofey/Stranorlar. Ulster Tyres has always been known for doing things differently and their mission is to be the most respected industry leader in providing the best products services and solutions through constant innovation. They adhere to strict professional standards and are known to set themselves apart from the competition. The company has achieved the highest standards of excellence in their field and have maintained it for over 38 years. The next goal for Ulster Tyres is to manufacture our own tyres, so the competition better watch out. Ulster Tyres have been members of council on both the ITIA & SIMI.